#7. Sitting by the pool on a hot summer day. This has been a tough one to fight this summer. Lots of hot days. #4. Oh yes, the mental wandering—thinking about a character, a scene, an idea that would be perfect in another book. Watching a person walk across the street and wondering what their story is, who is in their life, why are they here–why are they crossing this particular street at this particular time? It’s easy to let your mind wander to new material when you have to get the current WIP done. #2. And speaking of grandkids, this one fights with my #1 indulgence, and should probably be there, but my super big indulgence is spending time with my family, my husband, children, and grandkids. Teaching the one-and-a-half year old to hold and rock a baby doll and sing it to sleep, watching another sing in a choir, helping another learn to swim or ride a bike. And knowing when I do all these things, that I really don’t have time to load all those pictures up on Facebook to share. I have to write the book! 1#. Which brings us to: The Number One Guilty Indulgence For Writers, or The Catch 22 of Writing—The Writing Itself! When I am writing, getting the story down, working toward the deadline, sometimes as a wife, mother, grandmother, friend, etc., the top indulgence feels like the writing itself. I am pouring so much time and effort into it, especially when I’m working toward a deadline, that I don’t have time for all those other things. But when the book is done, and it’s good, and those great reviews start coming in, it’s awesome! Now what are your guilty indulgences? Leave a comment to enter my giveaway for a free e-copy of Heartbeats and Freefall! 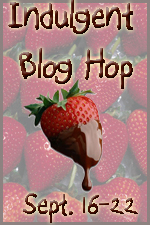 Then click the button below to enter the Ndulgent Bloggers GRAND PRIZE of $100 Gift Card Giveway and continue on with the HOP! Please let me know if you’re looking for a article writer for your weblog. You have some really great posts and I feel I would be a good asset. If you ever want to take some of the load off, I’d absolutely love to write some articles for your blog in exchange for a link back to mine. Please shoot me an e-mail if interested. Thanks! Thanks to all of you who visited my blog and left a comment. It sounds like the top indulgence here is chocolate, followed by a good book! Congratulations to Yvette for winning a free download of Freefall and Heartbeats. If you didn’t win, you can still check out my books on my MY BOOKS page. You can also find the buy links there. Both ebooks are available at Amazon, Barnes and Nobles Nook, and all major ebook outlets. My indulgences are books , chocolate, pepsi , watching True Blood, and one I forgot facebook games(they are so addicting). I didnt look for this, but I love this, found it entertaining! Keep up the awesome work! My number one indulgence is lots of yummy yummy books. My indulgences are books, chocolate and horror movies!! I love to indulge in romance novels and dark chocolate. Thank you for great blog and giveaway. I like to indulge in a good Merlot or a hot cup of Irish coffee. Chocolate goes well with either of them. lol Thank you for the giveaway. My indulgence is reading romance novels and playing RPG video games. My quilty indulgences are sitting up late night watching tv or playing on my computer and stuffing myself! Ice cream of chocolate are usually involved! Great giveway! I love books and coffee. Ice cream number one? Great minds, as they say, think ALIKE. without my Chunky Monkey or Cherry Garcia, I’d be lost. Others? Hmmm…reading of course. I’ve been on a Stephen hunter kick lately. Browsing at Pottery Barn or Williams Sonoma (which we finally got here, after years of waiting! ), enjoying summer in Canada (it’s so short, you have to! ), and a visit to Italian Centre for yummy imported noms. I can see a theme here, lots of chocalate and great books! Thanks for stopping by my blog! Now I need some more chocolate so I can keep writing. Indulgences are books and David Gandy! Thanks for the hop and the chance to win!